Vintage aviation found along the way, in various shapes and form: derelict & abandoned while other airframes bounce through the sky with total disregard to their age! The 'aviation stops' were part of a holiday trip and show my preferred 'diet': as much variety as possible (castles, manor houses, an archeological dig, beautiful gardens, pubs, film sites, aviation, etc) but I hope you will find my aviation account both entertaining as well as informative. a Gloster Meteor jet. Let me take you on a tour! This P.57 variant of the Sea Prince T.1 was optimized as observer training with radar nose and other design changes (41 built; f/f 28Jun51). Has been at least since 20 years here at Long Marston. www.oldprops.ukhome.net for more Percival Prince images. The airfield was constructed in 1940 upon privately owned arable farmland requisitioned in 1939 for war use by the Air Ministry. In 1954 R.A.F. Long Marston was decommissioned from public use by the Air Ministry, and the site was returned to the possession of the private landowners of the property in 1939. 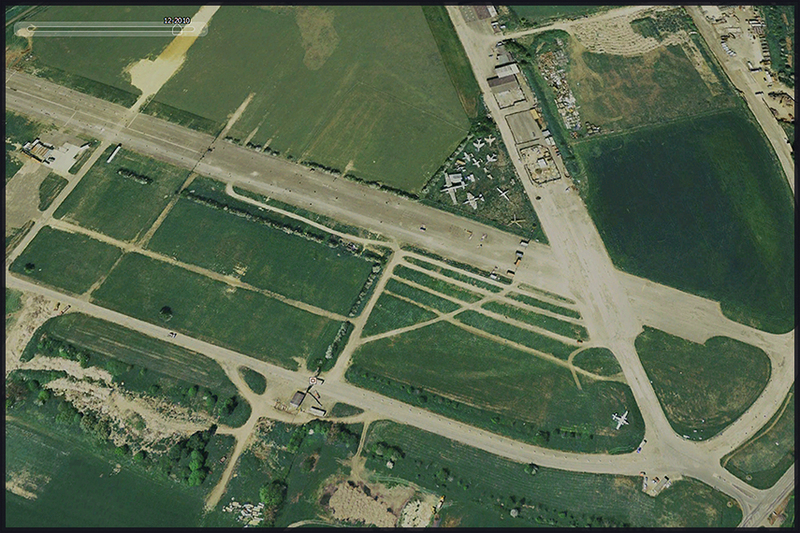 It was renamed 'Long Marston Airfield', and its facilities were made use of for the next six decades as a site for motor-sports events, and a variety of other commercial enterprises. Long Marston Airfield (Gloucestershire) was a Royal Air Force base between 1941 and 1954, situated approximately 3 miles (4.8 km) south west of Stratford-upon-Avon, near the village of Long Marston and Stratford upon Avon is not too distant. the Long Marston Clay Shooting Ground. It is also well known as a venue for summertime music festivals, including Godskitchen Global Gathering, the Bulldog Bash, and the Phoenix Festival. "Godskitchen', a festival: see above remarks on festivals. A carboot sale ongoing; and indeed, I picked up a very nice paperback novel by Philip Kerr! Some spare wheels was the first thing I came across while making my way to the Avro Shackleton. of taildragging type, wingtip fuel tanks and a pair of Viper turbojets for increased take-off performance (42 built). ex/ Jet Aviation Preservation Group. Mfr 1958 and delivered to 23MU 23Apr58. Issued to 206 Sqn June 1958 and coded E.
Despatched to the A&AEE Boscombe Down 03Apr59 for trials of the Maritime Tactical Position Indicator (OR/3042). The acceptance trial was completed 22May59 and the aircraft returned to St Mawgan 29May59. To 49MU Oct.'59 for Phase I modification by Avro CWP, completed Dec.'59, when issued to 203 Sqn and coded J. Cat.3 damage was repaired on site Aug.'61, when WR985 was sent to 49MU for Phase II update by Avro CWP. To 206 Sqn Feb.'62 and coded 'A' until despatched to Avro Langar June'63 for Phase III modernization. Completed Feb.'65, when WR985 returned to 206 Sqn and was coded T.
Cat.3 damage sustained in flying accident 13Sep65 was repaired by 60MU Oct.65 - Nov.65, the aircraft returning to 206 Sqn until transferred to 120 Sqn May 1966 as H.
To HSA Woodford June '66 - Oct.'66 for Viper installation, when WR985 returned to Kinloss for 201 Sqn (still as H). Transferred to Kinloss Wing Feb.'67 as H, remaining until Sep.'70, except for a visit to HSA Bitteswell Oct.'68 - Dec.'68 for modifications. Delivered to Cosford 25Sep70 for use as instructional airframe with No.2 SoTT. llocated maintenance serial 8103M on arrival. Offered for sale in 'fair condition' by MoD 1988 and sold to a private purchaser. During the 1970s, the Shackleton was replaced in the maritime patrol role by the jet-powered Hawker Siddeley Nimrod. During its later life, a small number of the RAF's existing Shackletons received extensive modifications in order to adapt them to perform the airborne early warning (AEW) role. The type continued to be used in this support capacity until 1991, at which point it has been replaced by the newer Boeing E-3 Sentry AEW aircraft. Not sure what this gadget would or could do, but seems something retractable, some sort of surveillance thing. Taking a look inside... Boys will be boys! By this latest Google Earth (2017?) image one would think there are be only 2 aircraft present, but there are 3! Delivered Anthorn 18Apr52 - Ford Station Flight 07May52 'FD/905' - 806 NAS Brawdy 02Mar53 - Ford Station Flight 23Apr53 'FD/905' - 781 NAS Lee-on-Solent 10Jul53 - Airwork Jet Conversion Unit St Davids 25Sep53 'BY/418' - accident at St Davids 05Apr54. Flight Refuelling Tarrant Rushton 17May54 for Cat.4 repair - AHU Lossiemouth 21Sep54 - Lossiemouth Stn Flt 21Jun55 'LM/905', 'LM/935' - Flight Refuelling Tarrant Rushton 01Feb57 for Cat.4 recon - AHU Lossiemouth 15May57 - Airwork St Davids 27May57 'BY008' - AHU Lossiemouth 22Oct57 - AHU Hal Far 21Feb58 - 728 NAS Hal Far 27Mar58 'HF/571'. Stbd u/c failed to lower and aircraft swung to starboard after landing 18May60 - ARS Hal Far 20May60 for repair - 728 NAS Hal Far 28Oct61 'HF/571'. Electrical failure and wheels-up landing 27Apr62 - NARIU Lee-on-Solent 21Sep62 - RNAY Fleetlands 22Oct62 - NARIU Lee-on-Solent 20Nov62 - 728 NAS Hal Far 11Dec62 'HF/571', 'HF/860'. Stbd tyre burst on landing 29Nov66 - shipped to UK - 5 MU Kemble 27Apr67 - Airwork FRU Hurn 03Jun67 '860' - sold to Moston Technical College, Woodford 12Feb69. SoC RN 11Mar69 - sold to The Aeroplane Collection 1974. Royal Umpire Museum, Croston, Lancs 29Jun74 - to WAM by Aug'77 on loan from The Aeroplane Collection - coded '-/888' - to Gordon Yates March '90 and displayed at the Stratford Aircraft Collection, Long Marston, Warks. To display with the Jet Aircraft Preservation Group at the same location - current. I wondered what this text might be, 'P.O.D. Hamburg'..? To do with Germany ('Willich')? I came across this location through the books (Vol.1 & Vol.2) by the brothers Barten & Barten. Aircraft types: (1941-onwards) No.24 OTU w/ Armstrong Whitworth Whitley, Avro Anson, Vickers Wellington and Avro Lancaster. No.1681 Flight operated Hawker Hurricanes and Curtiss P-40 Tomahawk. 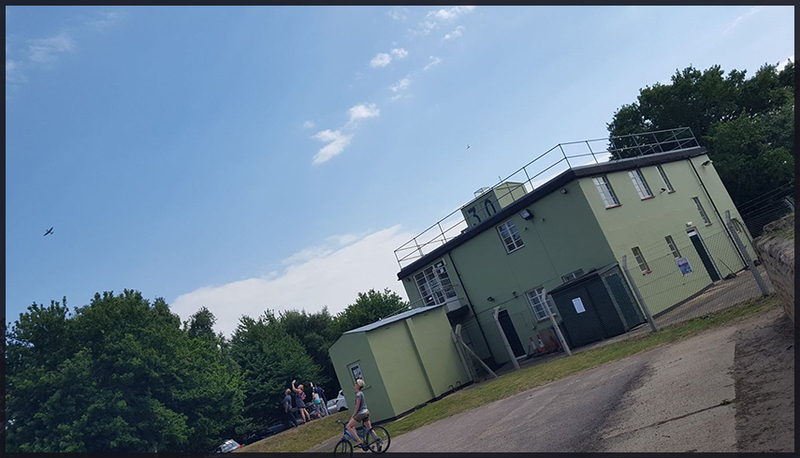 A microlight aviation club occupies the site and they use the ATC Tower, Watch Office w/ Ops Room for Bomber Satellite Stations, 7345/41, 13079/41 and 4170/43, as their office. Race tracks can be seen everywhere. Drag races, alongside other activities are held on this active airfield. Info valid by april 2016. Royal Air Force Cardington, or more simply RAF Cardington, is a former Royal Air Force station in Bedfordshire, England, with a long and varied history, particularly in relation to airships and balloons. The site started life as a private venture when aircraft manufacturing company Short Brothers bought land there to build airships for the Admiralty. It constructed a 700-foot-long (210 m) Airship hangar (the No. 1 Shed) in 1915 to enable it to build two rigid airships, the R-31 and the R-32. Short also built a housing estate, opposite the site, which it named Shortstown. In 1936/1937 Cardington started building barrage balloons; and it became the No 1 RAF Balloon Training Unit. The two airship sheds ceased being part of the RAF Cardington site in the late 1940s and they were put to other uses. Hangar 1 was used by the Royal Aircraft Establishment (RAE) to operate balloons on behalf of the Met Office. A company called Airship Industries tried to revive the fortunes of the airship industry in the Shed 1 (on closure of the RAE operation) in the 1980s, but the efforts ended in failure. As of 2016, the site was being used for the development of a hybrid airship, the Airlander 10, by the company Hybrid Air Vehicles. The Hybrid Air Vehicles HAV 304 / Airlander 10 is a hybrid airship designed and manufactured by British manufacturer Hybrid Air Vehicles (HAV). Comprising an airship with auxiliary wing and tail surfaces, it flies using both aerostatic and aerodynamic lift and is powered by four diesel engine-driven ducted propellers. The Airlander 10 has the distinction of being the largest aircraft flying today. During the 1990s, British engineer Roger Munk founded a company, Hybrid Air Vehicles (HAV), for the purpose of conducting development and marketing work upon on a large modern hybrid airship concept, referred to early on as Sky Cat. HAV formed a partnership with US aerospace and defense company Northrop Grumman to collaborate and promote the type to various military operators. Operationally, the LEMV was intended to be typically flown autonomously or as a remotely operated aircraft; for being transported to theatres of operation or within normal civil airspace. 'The Airlander is designed to use less fuel than a plane, but carry heavier loads than conventional airships. "Airlander 10 - has been given permission to return to the skies following a crash landing last August. The 302ft (92m) long aircraft - which is part plane and part airship - was damaged during a flight from Cardington Airfield in Bedfordshire. The flight deck is now back in place after major repairs and testing has begun inside a hangar at the airfield. The European Aviation Safety Agency has granted the craft permission to fly. This move follows the UK Civil Aviation Authority's Permit to Fly which was received a week ago. The developer, Hybrid Air Vehicles (HAV), says the aircraft can be used for a variety of functions such as surveillance, communications, delivering aid and even passenger travel. It says it will be able to stay airborne for about five days during manned flights." at the gate at 14:30 and they charged us 30 pounds per person (while my wife has little interest in planes). I thought that was an exorbitant fee and headed for the nearby pub. Where I did see this Tiger Moth pass over us. De Havilland DH.82A Tiger Moth - K2585 (G-ANKT); in fact ex RAF 'T6818'. C/n (msn) 85087. It was acquired by the Collection in 1966 and was rebuilt by two former engineering apprentices at Old Warden, using many components from two other Tiger Moths. The collection was founded in 1928 by aviator Richard Ormonde Shuttleworth. Some of the most notable aircraft in the collection are the five Edwardian aeroplanes, of which one is the oldest British aeroplane still in flying condition. What makes these exceptional is that they still fly (weather permitting). While back at the Airlander once more, at Cardington airfield, I noticed this three-some over Old Warden. My Tamron SP 150-600mm lens managed to record an acceptable image, even over that considerable distance! 'local lads' from the Shuttleworth Collection. 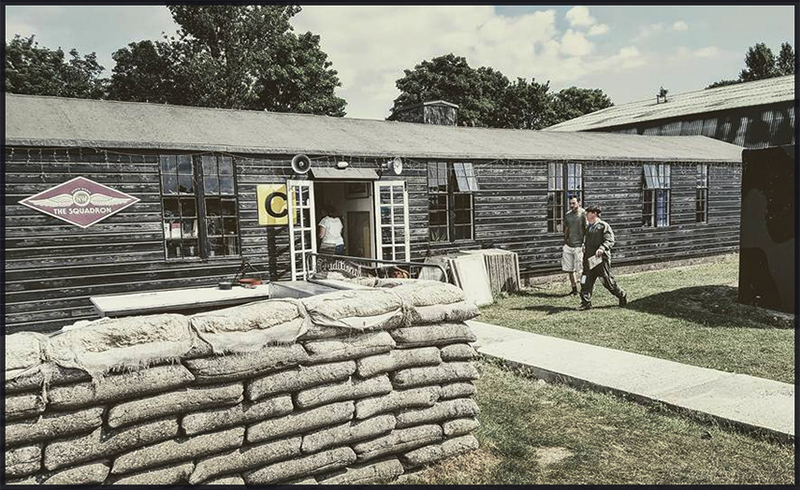 The Imperial War Museum Duxford is a branch of the Imperial War Museum near Duxford, in Cambridgeshire. On monday July 3rd I visited Duxford for the IWM hangars at the museum and see if some action was going on in preparation for the air show, the following weekend. I knew full well that I wouldn't have time to visit the hangars during the air show and the crowds were likely to be considerable. This scenario worked very well for me. This Spitfire was parked off-limits for an upcoming venue. Designed to replace the Avro York, the HPe Hastings was the mainstay of RAF Transport Command for a decade and was developed as a long-range transport that served with both the RAF and Royal New Zealand Air Force. The first prototype flew with 4 Bristol Hercules 101 radial piston engines on 07May1946 and the initial C.1 entered RAF service in Oct.1948. Production aircraft could accommodate 30 paratroopers or 50 fully equipped soldiers. The first of 14 squadrons to receive it, in October 1948, was No.47, and this unit took part in the Berlin Airlift. The new aircraft served alongside the York throughout the Airlift (Operation 'Plainfare'), flying vital supplies into the city during the Soviet blockade. A Hastings made the last sortie of the Airlift on 06Oct49. Production totalled 100 C.1s and 42 C.2s, the latter powered by 4 Bristol Hercules 106 engines, instead of the C.1s Hercules 101s. Four C.3s were sold to the New Zealand service and four C.4 VIP transports were constructed. The C.2 had a larger tail plane mounted lower on the fuselage and increased fuel capacity. All C.1s were rebuilt to this standard as C.1As. TG528 was the 30th Hastings C.1 to be delivered to the RAF and is in the colours of No.24 Sqdn. It was converted to the C.1A variant with greater fuel capacity and range, before its last serving with No.24 Sqdn at RAF Colerne, Wiltshire. It arrived at Duxford in 1979 and has subsequently been the subject of a four and a half year restoration programme. Great variety of civil- and military aviation in the AirSpace Hall. a Handley Page Halifax BVII (details on my IWM Duxford 2017 page). Al future projects (@Hangar 5). and find out how the RAF defended its skies during key battles in the World War Two. V-2, WW2 weapon of mass destruction! The V-2 (German: Vergeltungswaffe 2, 'Retribution Weapon 2'), technical name 'Aggregat 4 (A4)', was the world's first long-range guided ballistic missile. The missile with a liquid-propellant rocket engine was developed during the Second World War in Germany as a "vengeance weapon", assigned to attack Allied cities as retaliation for the Allied bombings against German cities. The V-2 rocket also became the 1st artificial object to cross the boundary of space with the vertical launch of MW 18014 on 20 June 1944! The other Boeing B-17 at Duxford, the airworthy Sally B, was ex F-BGSR. One of several B-17s to fly with French Surveying Company IGN. She came to Duxford by road in the mid-1970's. It was originally restored as 'Mary Alice' with the tail number '231983', but a repaint (2015?) has seen her put into this colourscheme with a different false (dedication to?) tail number. Ron Mak photographed it, also at Duxford, in 1991; check Ron's Gallery #3.
being owned and flown by the Canadian Warplane Heritage Museum! Lincolnshire's Battle of Britain Memorial Flight Lancaster has flown for the 1st time in 9 months following major maintenance work. Testpilot (Seb) tweeted: "Absolutely lovely to fly this old girl again today. She has been restored beautifully by @Aircraft_ARC at Duxford and flew like a dream." Lancaster PA474 has undergone a full deep strip down and inspection by a team of 9 technicians from the Aircraft Restoration Company at the Stephenson Hangar at Duxford. A number of sheet metal repairs have been made to the airframe skins and bomb bay doors. The number four engine firewall was replaced after the aircraft suffered an in-flight engine fire in May 2015 so, it was not removed during the restoration. North American P-51 Mustang '413318 / Frenesi' on finals. G-PBYA was originally ordered for the Royal Canadian Air Force as a Canso A amphibian (c/n CV-283), basically equivalent to the US Navy PBY-5A. It was taken on charge by the air force on 27Oct1943 and military serial 11005 was assigned. With the war over, 11005 was no longer required in its originally intended role (anti-submarine patrols) and it entered a period of storage at Moose Jaw before being converted to a freighter in 1948. Returned to service, 11005 flew with No.413 Survey (Transport) Squadron and later with No.121 CU/CR Flight. It now flew photographic reconnaissance missions surveying the Arctic regions, search-and-rescue and flood relief supply flights. It was finally struck off military charge on 25May61, having been stored at Vulcan, Alberta, and was disposed of by the Crown Assets Disposal Corporation to the commercial company Frontier Air Transport (based in nearby Calgary). Prior to this, it had lost both its bow turret and side blisters as part of its post-war conversion. CV-285 was registered CF-NJF for its ferry flight to Calgary. CF-NJF was in due course converted to carry internal tanks by Field Aviation and was taken on by the well-known Catalina/Canso operator Kentings. In addition to carrying Kenting titles, it was also chartered to the French operator Protection Civile and flew with them for a number of fire fighting seasons during the mid- to late-1960s, based at Marseille. It carried a blue rear hull band and was known by the call-sign Pelican Bleu. At first registered F-ZBAY, it later flew as F-ZBBD although it seems to have reverted to its Canadian marks each time it returned to Canada. In 1974, it joined Norcanair, a fire fighting company based at Prince Albert,SAS. It carried the fleet number 14 in large orange numerals below the cockpit. A few years later, its registration was amended from CF-NJF to C-FNJF in accordance with new Canadian practice. Around 1980, it was taken over by the Province of Saskatchewan at La Ronge, who continued to use it as a water bomber within their own fleet of fire fighting aircraft. It acquired a new yellow overall livery with green trim and fleet number 7. By the late-1990s, the Saskatchewan Cansos had been disposed of and two of them including C-FNJF were acquired by Hicks & Lawrence and stored for a while at St Thomas, Ontario. They were then ferried to Nanaimo on Vancouver Island, where Catalina Aero Services were engaged to convert them into passenger carrying aircraft for tourist flights in Zimbabwe! This venture never got off the ground and both Cansos remained at Nanaimo where they were put up for sale. Stored in the open for quite some time, C-FNJF was eventually purchased by Plane Sailing Air Displays. At Nanaimo the water-bombing equipment was removed and seating put in its place and also one-piece smoked perspex blisters, with hydraulic operation, were installed in the rear hull, to give passengers a panoramic view. A hydraulic airstair was put into the rear hull to make entry and exit easier. C-FNJF saw a long period of work on the aircraft being done, to make it ready for the long ferry flight to the UK and to satisfy Transport Canada authorities. C-FNJF left Nanaimo on 01Mar2004. Following its triumphant arrival at Duxford, C-FNJF flew at a good number of airshows during the 2004 season. At the end of that, C-FNJF entered a period of overhaul and it was re-registered as G-PBYA on Nov.19th. The start of the 2005 season saw G-PBYA still flying in its bright yellow, red and green colours, but in May it flew the short distance from Duxford to Cambridge where it was repainted to representing a wartime USAAF OA-10A Catalina 44-33915 of the 8th Air Force / 5th Emergency Rescue Squadron at Halesworth, Suffolk. The Catalina is operated by Plane Sailing Air Displays Limited on behalf of Catalina Aircraft Limited, which is made up of a number of shareholders. The enterprise is supported by its own 'fan club' - The Catalina Society. Harvard T6 'Wacky Wabbit' of Classic Wings taxies past a Supermarine Spitfire. The 'T6 Harvard' syndicate decided in August 2014 to repaint G-BJST in a new colour scheme for the 2015 season as the paintwork needed replacing. It was decided that AJ841 would be repainted as a former RAF Desert Air Force (DAF) MK.II Harvard. Richard Pike & Sam Woodgate of RS Paintworks (based at Fishburn airfield) took care of the sponsoring. Fowlmere squadron which is a stones throw from Duxford, just to the west. As with a lot of wartime aircraft there were many variations in camouflage colours, roundels styles and sizes. After much research it was settled on the current colours, patterns. History comes alive at this place! The amount of Spitfires (and other warbirds) seems ever increasing at this Flying Legends event! An impressive gathering of North American P-51 Mustangs. More images of the air show on my Flying Legends 2017 page. 27-litres (1,650 cu in) capacity. Rolls-Royce designed the engine and first ran it in 1933, as a private venture. aero engines after birds of prey. Spitfire T.9 PV202 5R-H 'Bremont; quite a unique 'Spit': a two-seater. Not easy/cheap to get in the back seat, me thinks! This Spitfire aircraft was built as a single-seat LFlX fighter at the Castle Bromwich factory of Vickers Supermarine, in 1944, as part of contract No. B981687/39. It was delivered to the Royal Air Force at No.33 Maintenance Unit at Lyneham in Wiltshire as PV202 on 18Sep44, where it was brought up to operational standard for service delivery. During World War Two, it flew with No.33 Sqdn from Merville in Northern France, carrying the codes '5R-Q'. It was tasked mainly with ground support of offensive operations as the allied forces pushed further into Europe and was also engaged in the harassment of enemy troop movements by carrying out strafing attacks on road and rail convoys. PV202 had carried out 20 operational sorties with ten pilots from Britain, Denmark, Holland and South Africa during its service with No.33 Squadron. It was subsequently issued to No.412 Sqdn of the Royal Canadian Air Force, operating from Heesch in Holland; it carried the squadron identity 'VZ-M', later changing to 'VZ-W'. Operations were still to strafe the enemy moving on the ground and the squadron eventually moved further into Germany itself, being based at Rheinand Wunsdorf forward operating airfields. In July 1945 it was put in storage. And it was converted at Vickers-Armstrong's Eastleigh factory to a trainer, delivery was completed in June 1951. The Tr.9 Spitfires were used to train pilots for the Irish Air Corps (IAC) Seafire fleet. In time, the IAC retired its Seafire fleet and the Spitfires took on their duties, until in 1960 they too were retired. This Spitfire was then used as an instructional airframe and fulfilled this role from Dec. 1960, until it was sold to Tony Samuelson, a collector who was supplying aircraft for the Battle of Britain Film Company. Samuelson bought four Tr.9 aircraft from the IAC, two of which were made airworthy and used in the filming. This one however, remained on the ground and was never used, remaining in store in Cricklewood. a two-seater and eventually fully rebuilt. First post restoration flight, from BAe Dunsfold, was on 23Feb90, now wearing its No.412 Sqn colours as PV202 'VZ-M'. Rebuilding PV202 brought its own challenges by way of its damage and the very fact that it was the first Tr.9 variant the company had tackled. Karel Bos decided to present the aircraft in the colour scheme it wore when delivered to the IAC in 1951 and to convert it back to its original configuration, with the bubble top rear canopy. The aircraft was substantially complete by Feb.2004, but issues delayed the first post-restoration flight to 13Jan2005. In March 2007 the Dutch owner had the aircraft painted in Royal Netherlands Air Force colours to represent 'H98', one of three Spitfire Trainers sold to the Netherlands in March 1948. The aircraft showed off her new colours at the Antwerp Airshow in May 2007, before going on to appear at many air shows and events in the UK. For the 70th Anniversary of the Battle of Britain, 2010 saw the aircraft repainted to represent Spitfire X4474 of Duxford's No.19 Squadron. 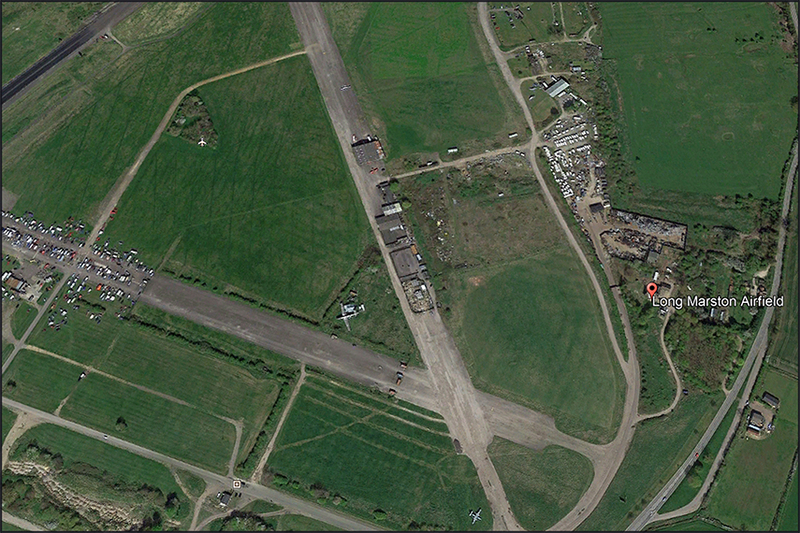 The squadron was based at Fowlmere airfield, near Duxford during the BoB. Note the cut-off wingtips and the 5-bladed prop! The Curtiss H-75 was a private venture which flew for the first time in May 1935. Following development and a new engine, 3 prototype aircraft were ordered by the US Army Air Corps under the designation Y1P-36. This eventually led to the P-36 lineage, which went on to serve with around a dozen air arms across the world, including the USAAC as the P-36, the RAF as the Mohawk, and France as the H-75. Hawk No.82 was saved from scrapping in the 1950's and was placed in storage in France, until acquired by the TFC in 1995. Following a major overhaul in the US she made her UK debut in 2005. It wears an authentic Armée de l'Air standard three-tone scheme, with her GC 11/5 markings on her port, and the Lafeyette Escadrille Sioux Indian head motif (the TFC logo) on her starboard side. The Fighter Collection's Hawk is a very rare aircraft, along with the Fighter Collection P-36 they are the only versions of this aircraft airworthy anywhere in the world! The Fighter Collection's Merlin-engined P-40F is one of only two left airworthy anywhere in the world! Manufactured at the Curtiss facility in Buffalo,NY in the autumn of 1942 and was allocated BuNo. 41-19841. Unfortunately her service career remains a mystery, but the only P-40Fs to see combat in the Pacific Theatre were flown by the 44th and the 68th Fighter Squadrons, of the 347th Fighter Group in the Solomon Islands, from Nov.1942 to Oct.1943. TFC's Warhawk ended her wartime career when she was condemned by the USAAF in Nov.1943 and dumped on the largest of Vanautu's islands, Espiritu Santo. She was eventually recovered from the island in the 1970's and acquired by The Fighter Collection some years later and stored in Australia, until the restoration commenced in Wangaratta, Victoria. The in-depth restoration was completed in early 2011 and this P-40F made her 1st flight for 68 years in April of that year! Due to the lack of information on her service history, it wears the stunning scheme of Lee's Hope from the 85th Fighter Squadron, 79th Fighter Group, which was flown by Lt. Robert J. Duffield from Capodichino airfield, in south of Italy in early 1944.
was in much worse shape than the other, 41-13390. P-40C Warhawk 41-13357 was accepted by the USAAC on 6th April 1941. Having amassed 603 hours, it was returned to the Curtiss Factory in Buffalo,NY, where it was overhauled for the Lend-Lease programme with the Soviet Union. The P-40C was then duly shipped to the USSR in Dec.1941. The history past this point is still relatively unknown. This aircraft wears the scheme of 39-159, a P-40C that was stripped of it's olive drab camouflage paint and used as a personal 'hack' for base commanders. The restoration culminated on the 05Aug2011 when the aircraft (then reg'd N80FR) had its 1st post restoration flight in the hands of Steve Hinton. where it made it's UK debut. 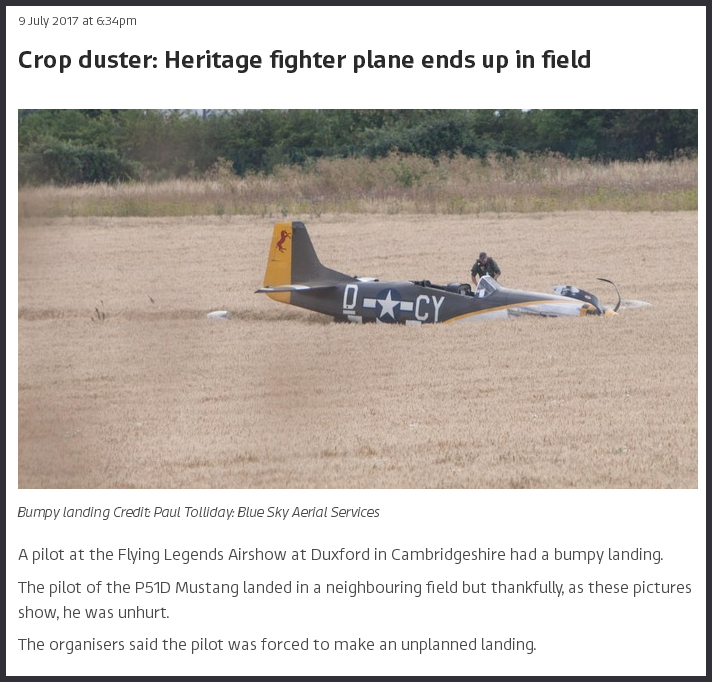 Not only TF-51D 'Miss Velma' was damaged in the wheels up landing during this Flying Legends air show, also (in a separate incident) the P-51B 'Berlin Express' fell vicitim to damage! It had its Malcolm hood disintegrate during a low pass, damaging the tail surfaces of the aircraft. Fortunately, nobody was hurt in this incident either. The 'Berlin Express' recently crossed the Atlantic to participate in this airshow. 2014: Nov 07, first-flight, John Muszala at the controls - Congrats to Pacific Fighters! This aircraft was manufactured in 1944 for the United States Army Air Force (USAAF) and registered with military serial number 44-73877. She did not see combat action during WWII. During 1951 she was delivered to the Royal Canadian Air Force, where she served until 1958. From 1958 to 1980 the aeroplane was flown by various private owners. After an extensive rebuild from 1980 to 1985 she was registered N167F and bore the 'Old Crow' colour scheme of Col. Clarence Anderson, who's signature remains on the left undercarriage door panel ! In 2012 she was purchased by a UK owner and delivered to the UK in August that year. Since then the aeroplane has been overhauled and refitted, she is now in the colour scheme of Lt. Blanchford, RAF 112 Squadron which operated from Italy in 1945 on ground attack missions over the Balkans and along the Adriatic coast. Goodyear Corsair FG-1D 'KD345/A' (G-FGID) in Royal Navy c/s. Manufactured in 1945. When the Chance Vought FG-1D Corsair was introduced in 1940, it boasted the most powerful engine along with the largest diameter propeller of any fighter aircraft in history... The result of this engine and propeller combination was the first fighter to exceed 400mph. Corsairs were built right up to 1952, giving the type the honour of having the longest production run of any American piston-engined fighter! G-FGID was built under licence by the Goodyear Aircraft Corporation at their facility in Akron,OH and allocated BuNo.88297. She was accepted by the US Navy on 09April1945 and delivered a mere 2 days later. She was initially dispatched to Guam in the Pacific. After WW2 she returned 'State-side'. It then spent a number of years being allocated to various US Naval Air Reserve squadrons, as well as varying periods of storage, until she was eventually put up for disposal in March 1956. She was purchased by ALU-MET Smelters in January 1959 and languished in their yard, until being rescued a year later by legendary stunt-pilot Frank Tallman. In his book The Great Planes, Frank Tallman calls her his all-time favourite aircraft. Frank Tallman parted with the Corsair in 1966, and she passed through a number of other civilian owners until joining The Fighter Collection fleet in 1986.
it was delivered to HMS Heron (RNAS Yeovilton), collected on 29Jul41 by No.880 Squadron and went on to the Orkney Isles. On 05Apr42 the aircraft was delivered to David Rosenfield Ltd for repair. On Dec.07th it was delivered to the Naval Fighter School (No.759) Squadron at HMS Heron and by autumn 1943 had moved to Loughborough College as an instructional airframe. In 1961 an attempt was made to make the Hurricane airworthy for the Battle of Britain film, but the work involved was too great. In January 1986, the team that had restored Spitfire VC AR501 took on the task in a joint operation between the Shuttleworth Collection and the Imperial War Museum. This is the last airworthy example of a Hawker Sea Hurricane 1B in the world and flies regularly! Hawker Hurricane, note the huge flaps extended here. The reason of my visit: Douglas C-54D-DC N44914 (c/n 10630/361). During my visit in 2003 I found two here : UK2003 which is also where you'll find its history. An overdue revisit to North Weald for me, see my 2003 report. Weald for so many years. It's decorated with its US Navy BuNo.56498 and attempts are made to revive it again! I suspected that the aircraft in question was of historical importance, so I wrote to the Smithsonian Museum and asked for the aircraft's records. Two months ago I received these in the post and the results blew me away. What I discovered is that this aircraft was a WW2, Korean War & Vietnam veteran! Her primary base was Pearl Harbor and she flew her ops in the Pacific from 1945 until 1973. In the last two months we have gained sponsorship of £200k and we require another £500k of funding to get her airworthy again. Which considering the size of this aircraft is just a drop in the bucket of a Spitfire or P-51! and mentoring them throughout the process of the restoration. The chief engineer is Sam Evans, who was responsible for structural engineering on the Vulcan XH558. We have pilots who want to fly her queuing up too! We have a large global following in 45 countries and our aim is to have this aircraft ready for 'Flying Legends' and RIAT 2018. 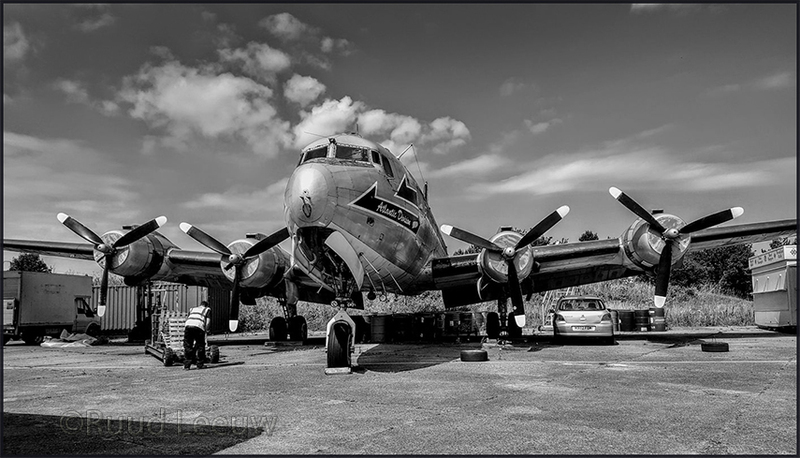 The next will be to fly her to Berlin for the 70th anniversary of the Berlin Airlift and then onto Oshkosh in 2019!" Hope to see it fly again. outside by the history on photos. In town big celebrations for the MH100 event, many people about on the 'Commons'; even a flypast by a Spit & Hurricane! the Battle of Britain Flight (later BoB Memorial Flight) with their Spitfire and Hurricane. The airfield closed in 1963. Open Sunday afternoons 2pm to 5pm from Sunday 2nd April 2017 and every Sunday to the end of October. The 356th Fighter Group of the United States Army Air Force was based here at Martlesham Heath from October 1943 to May 1945. It was formed in the United States on December 8th 1942 and consisted of three squadrons, the 359th, the 360th and the 361st. They were despatched to England on the Queen Elizabeth in the autumn of 1943 and were first based at Coxhill in Lincolnshire where they were equipped and received their aircraft. They were Republic Aviation P47 "Thunderbolts". Many of these were flown to England via the northern route. Refuelling in Newfoundland, Greenland, Iceland and Scotland en route. They then flew to Martlesham Heath in October 1943. Pilots of the 359th Fighter Squadron were billeted at Kesgrave Hall. Pilots of the 360th Fighter squadron were billeted at Playford Hall and pilots of the 361st Fighter squadron were billeted in houses around the aerodrome at Martlesham. For a while the Americans shared the aerodrome with Typhoons of 56 Squadron, RAF. From October 1943 until early January 1944 the 356th FG were deployed escorting B17's and Liberators on their daylight raids over occupied Europe. Then their role changed to bombing and straffing missions. In November 1944 the P47's were replaced by the North American P51 'Mustang'. Armistice was declared on May 7th 1945 and the Americans left for New Jersey in May and the 356th Fighter Group were disbanded on 10 November that year. 72 Americans lost their lives whilst serving at Martlesham and they are remembered on the war memorial on the Barrack Square at Martlesham. remains. There are many very interesting exhibits in the Museum covering both USAAF and RAF history. This location was another one I found through the books (Vol.1 & Vol.2) by the brothers Barten & Barten. It was actually closed this day, earlier than normal because of the 'MH100 festivities' but the volunteers were lenient. 'XR-D' AND 'R9612/LC' ARE two Spitfiress performing together, synchronised flying in perfect harmony! Four Hurricanes appraoching, a unique sight!